Congratulation to all Up graded Employees. Government of Pakistan Finance Division. Grant of Pre-mature Increment on Up-Gradation. 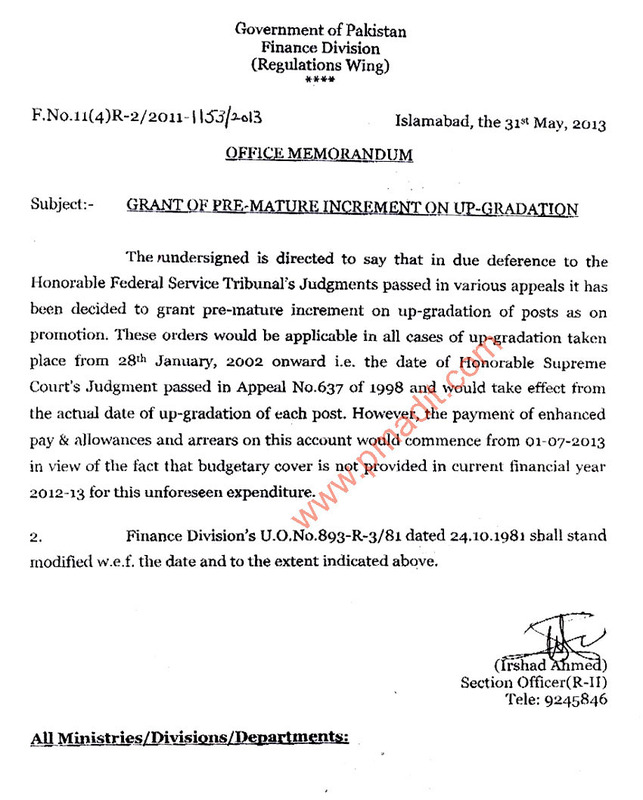 The undersigigned is directed to say that in due deference to the Honorable Federal Service Tribunal's Judgments passed in various appeals it has been decided to grant pre-mature increment on up-gradation of posts as on promotion. These orders would be applicable in all cases of up-gradation taken place from 28th January, 2002 onward i.e. the date of Honorable Supreme Court's Judgment passed in Appeal No. 637 of 1998 and would take effect from the actual date of up-gradation of each post. However, the payment of enhanced pay & allowances and arrears on this account would commence from 01-07-2013 in view of the fact that budgetary cover is not provided in current financial year 2012-13 for this unforeseen expenditure.